This weekend goes down in the record books as one of my favorite races to date! 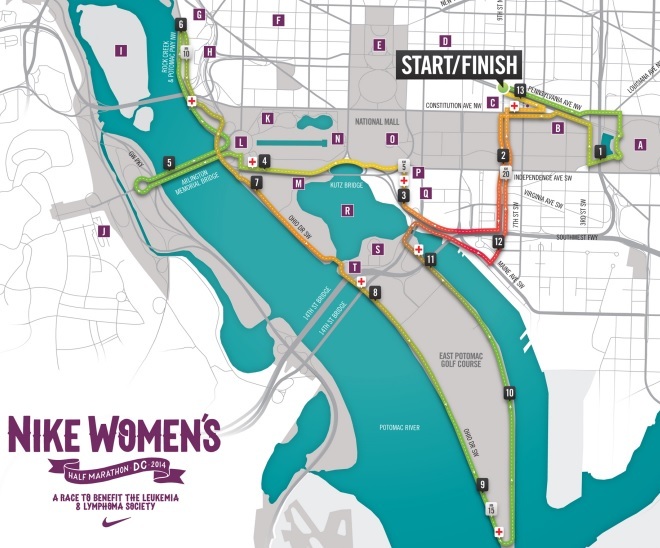 For two years I have tried (unsuccessfully) to win a spot in the lottery for the Nike Women’s Half Marathon in DC. On Friday, I got the call of a lifetime and was offered a sport to run as a charity runner and used my lunch break to zip down to the “expotique” (just a few blocks from work) to write my donation to the Leukemia and Lymphoma Society and pick up my packet. 30 minutes later I was back at work and on cloud nine! Everything ran so smoothly and as soon as I got the call I knew I could not turn this opportunity down. 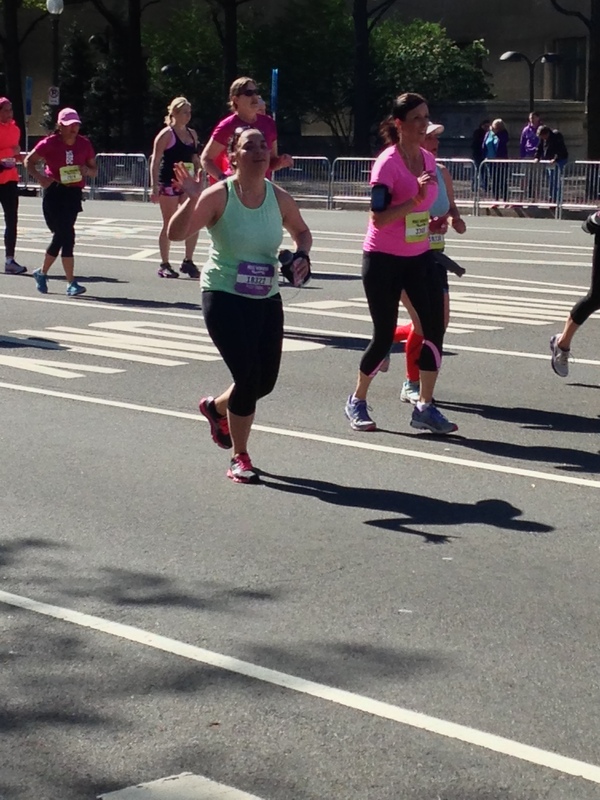 My only hesitation was that I was not in “racing shape” because I had not been training for a half marathon. I am, however, down 15 pounds since my first half marathon a year ago and am running more consistently than when I trained for any of my other races. Knowing that I was in better overall shape now that I have been for any previous race in the past two years…I knew I could do it! 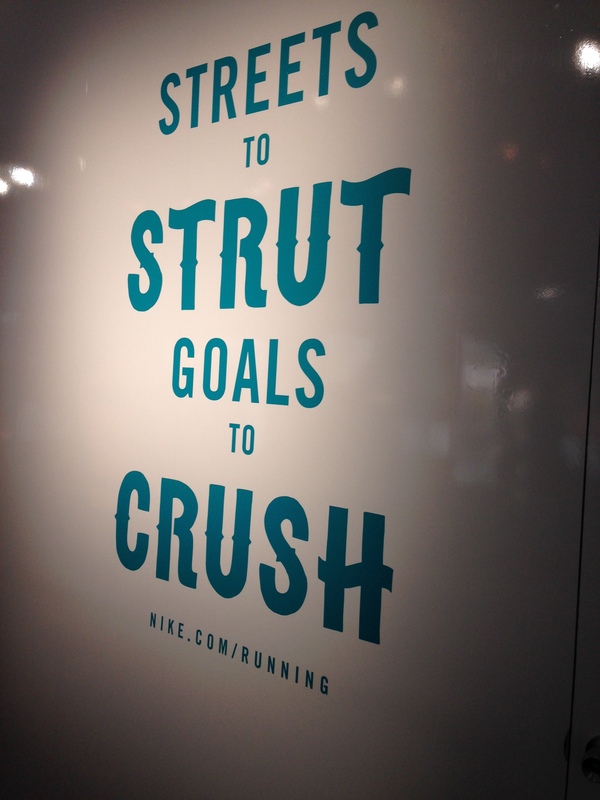 Nike knows how to put on an adorable expo! Once I picked up my packet I went and picked up my dri fit shirts. 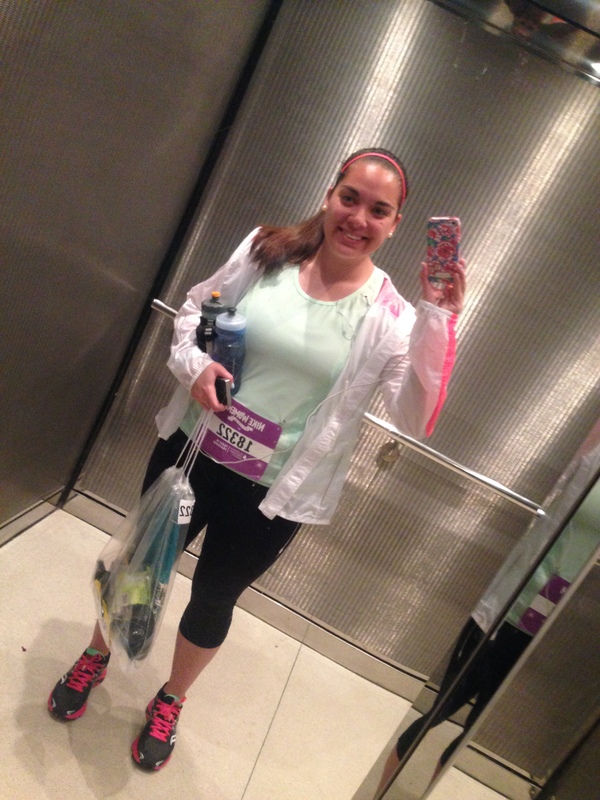 I wore it while running errands on Saturday and it was so comfy – it will be a new favorite running top. Then I headed into the “expotique” and took a look at their Nuun stand, the adorable course map, the gear they were selling, tested out some Luna Bars, and checked out the adorable Paul Mitchell Salon inside the tent. Women’s races are fun!! On Saturday Max and I ran our usually Saturday routine of visiting the farmers market (to pick up muffins from Enzo the muffin man of course) and grocery shopping. In the afternoon we attended a friends wedding mass and reception. Sadly no drinking or candy for me because of the race on Sunday. 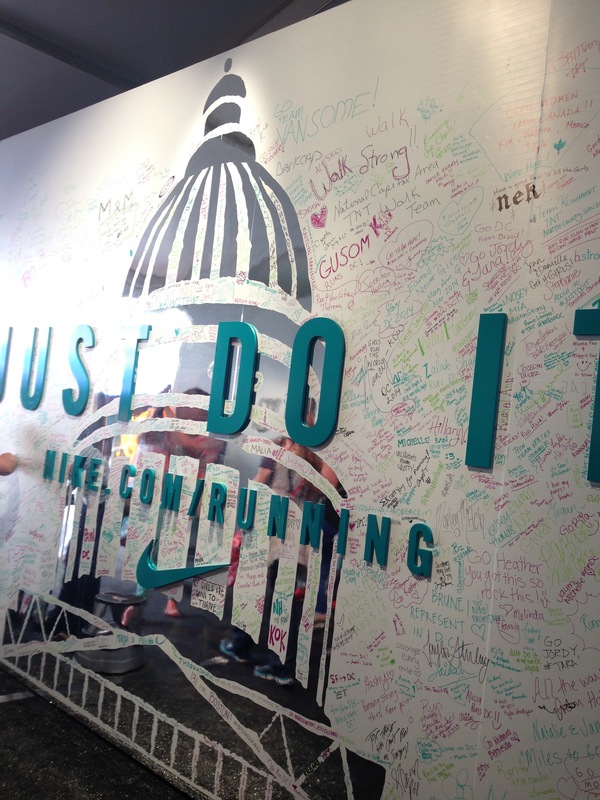 On Saturday, we took a little pit-stop at Road Runners Sport to pick up some last minute race day essentials. 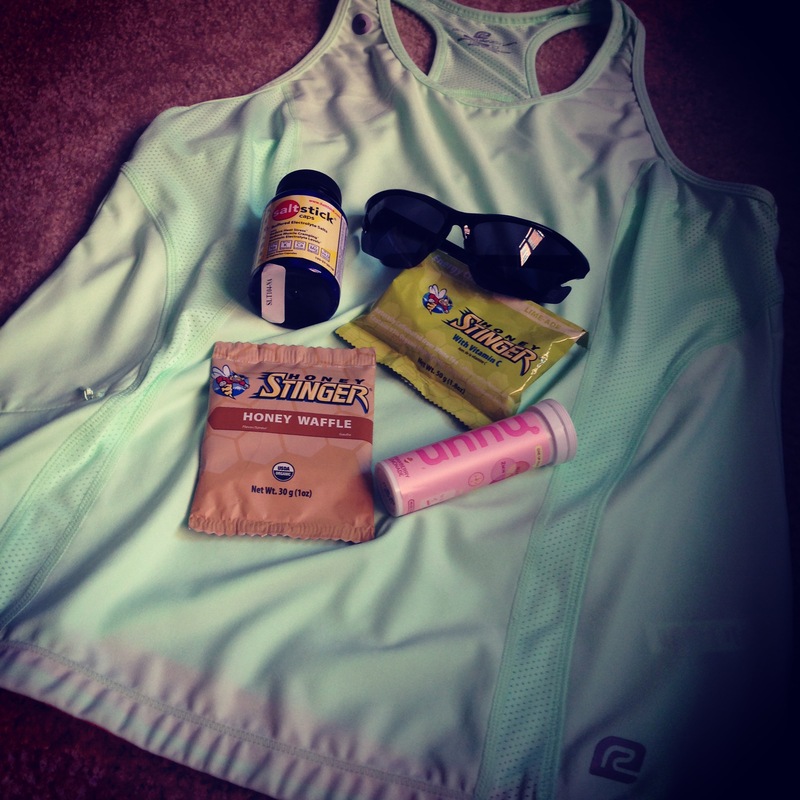 I picked up a new running tank top with headphone holes and a phone pocket included, a new pair of no-slip running glasses, salt stick pills, Nuun, a honey stinger waffles for a pre-run snack, and honey stinger chews for each mile. Their VIP membership saved me $10 yesterday alone. WORTH IT! 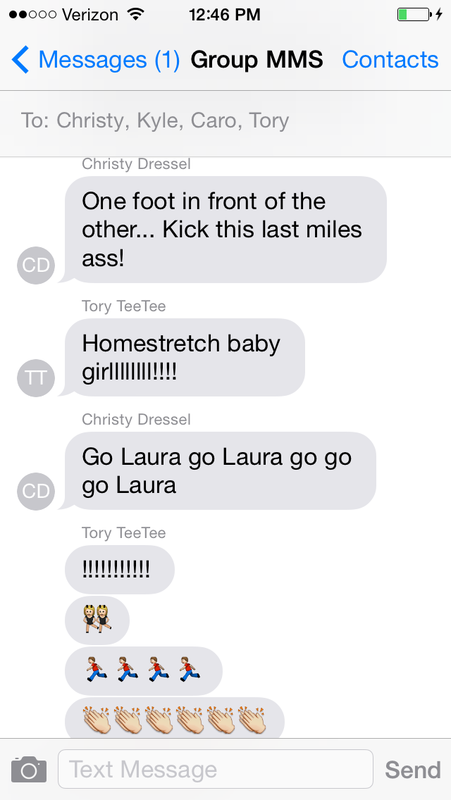 I know I broke the cardinal “no nothing knew on race day” rule…but it was worth it. Nothing chafed, everything agreed with my belly, and everything fit well. This was the first race I used Saltsticks with and I will NEVER run a race without them again! AMAZING! 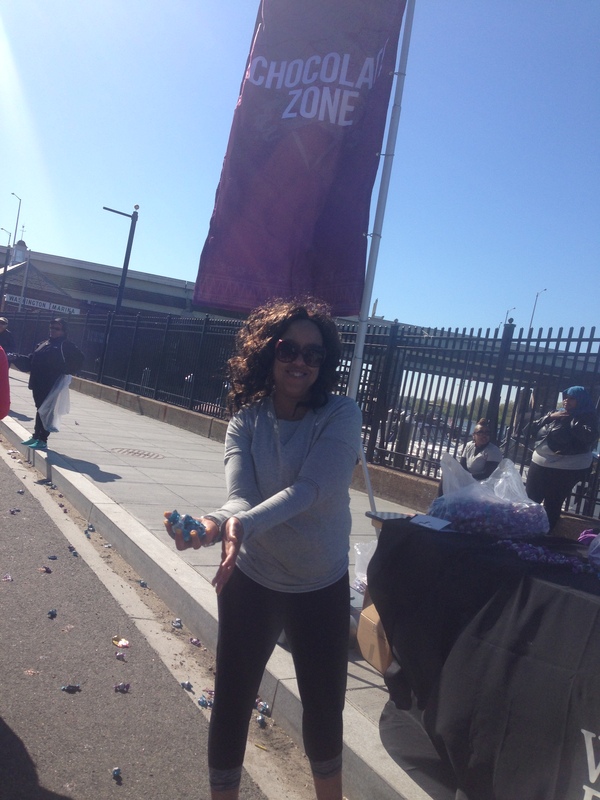 They kept my legs from cramping the entire 13.1 miles…even on my dreaded mile 9 “sure cramp” mile! My jitters on Sunday morning we so horrible that they had me up at 3:30 AM…so with less than 5 hours of sleep. 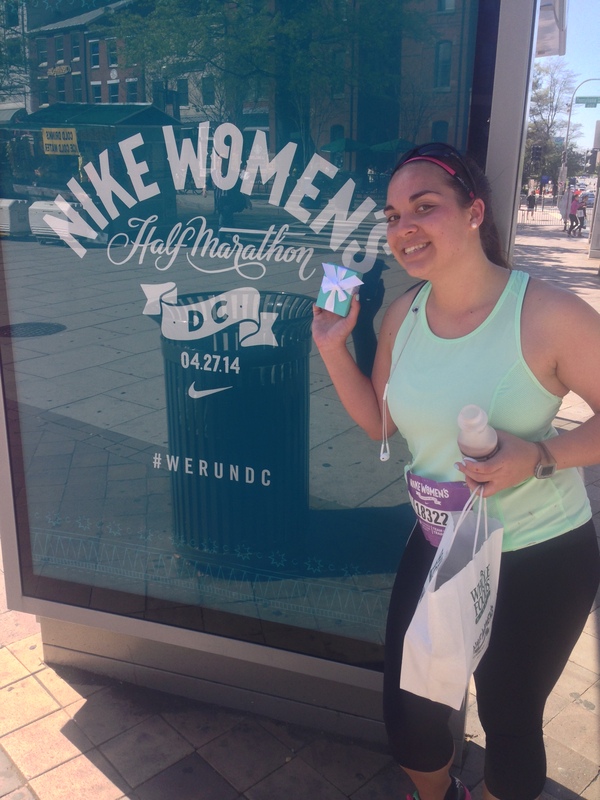 I kept having horrible thoughts about calf cramps, not training (ok…I didn’t train), not meeting the race course cut off times, and not finishing. So sad! So I woke up and started to stretch and eat breakfast. I always eat a banana and a piece of toast with peanut butter on it. Today was no exception! I finished 1 bottle of Nuun while getting ready, packed one to drink while I stretched at the start line, and carried one in my holder. I applied half a roll of KT tape on my legs and created a secure masterpiece that I am sure help keep much of my pain at bay throughout the morning. Finally, I packed my bag and opted for an Uber car to pick me up and drop me off at the start line. 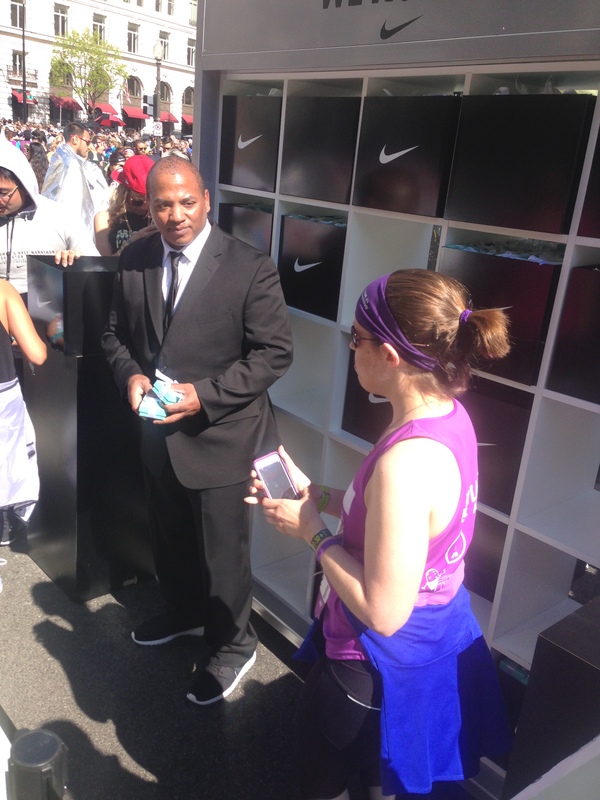 After all, they were a Nike Women’s Half Marathon sponsor and I had a $10 credit to use as a participant! 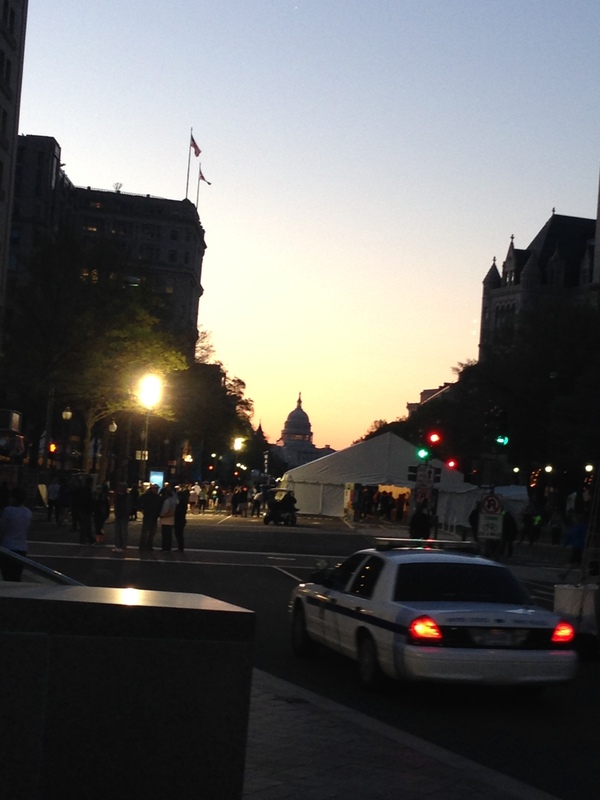 I hate feeling rushed on race morning, so I was at the start/finishers village at 5:30 for out 7:00 AM race. 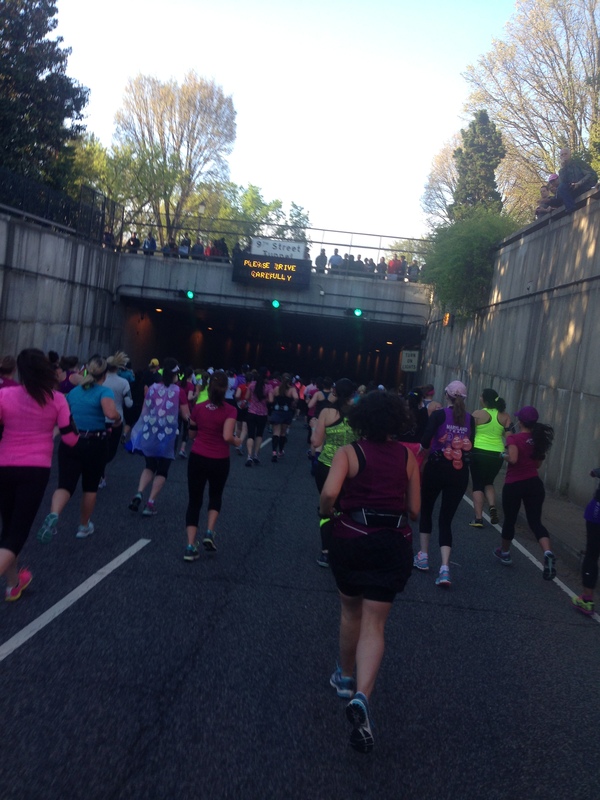 The first two miles zoomed by and we kept a great 10:50 pace until I was side lined by having to go to the bathroom. 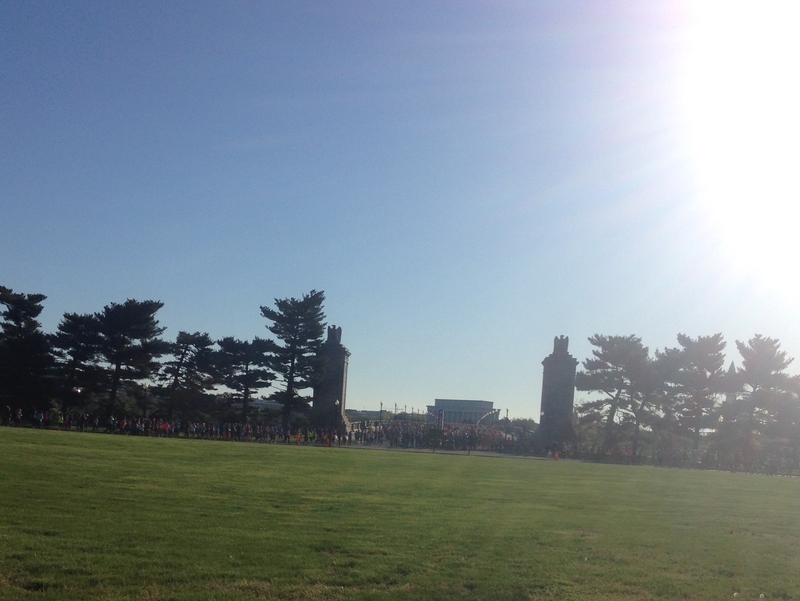 Anyone who has run a race knows just how horrible the portapotty lines are which also really mess up your time. Waiting in line took at least 3 minutes off of my times…oh well. Not much you can do! At mile 3 we hit the orange station at the Manadrin Oriental Hotel which was deliciously refreshing on a sunny day like today. 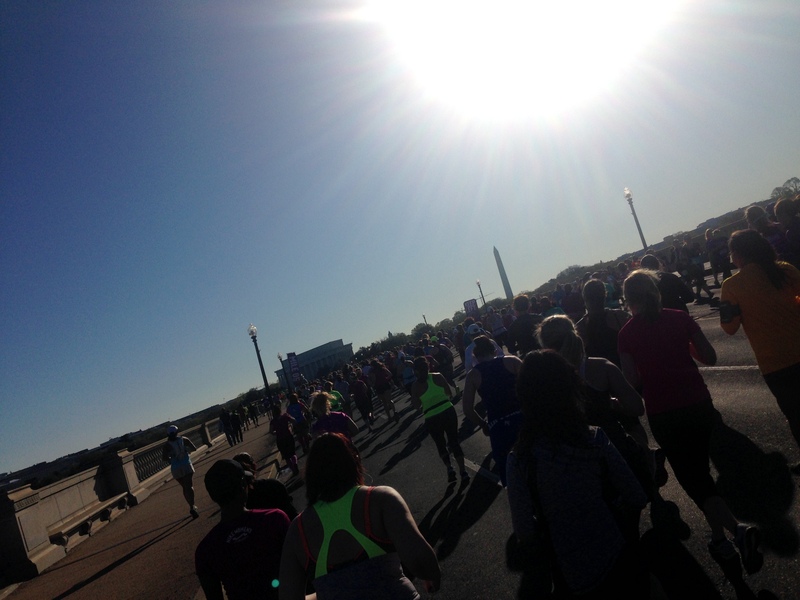 Throughout the entire course supporters were cheering and high-fiving runners which was excellent motivation. The stations and aid kept getting better from there! Unlike previous races I hydrated really well in the 48 hours leading up to the race and I wrote out a plan for race day. I carried 1 small honey stinger chew for each mile after mile 4 and carried a bottle of water with me in my holder. I planned to take BOTH 1 Nuun cup and 1 water cup at each station AND take the course aid (shock blocs, etc.) and that really helped. 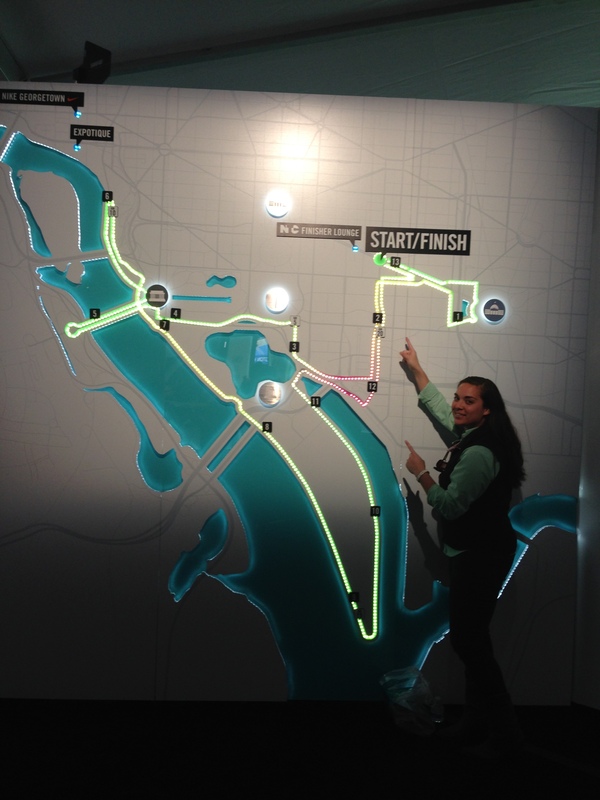 I felt hydrated and fueled the entire 13.1 miles…no bonking! We are what we eat! A new PR! More on that later! One of the biggest highlights of my day was setting a new PR! I am a proud slow runner and seeing friends finish with sub 2 hour times is such an inspiration! 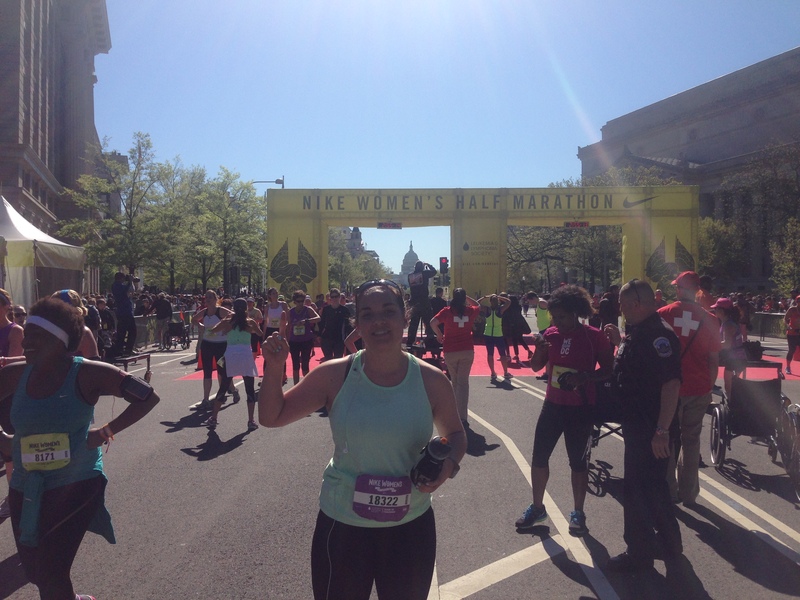 My Rock and Roll DC Half Marathon time in 2013 was my PR (2:55:50) and my Woodrow Wilson Bridge Half Marathon Time was slightly above that. When I got to mile 7, just over the half way mark, I took a look at my watch and did the math…I could PR if I keep this pace…and there’s some wiggle room. I didn’t want to psyche myself up for disappointment so I tried not to dwell on it. Once I hit mil 11 I knew it was within reach and at mile 12 I knew it was mine! I could see Max at the finish line and crossed the clock at 2:41:04. I beat my previous PR by 14 minutes and 46 seconds today! AHHH! I look at my watch when I crossed the finish line, did the mental math, and broke down and cried on the “red carpet” finish line. A police office saw me and asked if I was hurt and needed medical attention. I laughed and told him I was fine. He looked relived and said, “did you PR?” and I nodded and he asked if I wanted my picture taken, haha! I made my way down finishers village and was wrapped in a heat blanket, handed an ice cold water bottle and chocolate milk, and given a treat bag of snacks from Whole Foods. Then the moment we all waited for…the Tiffany’s & Co. necklaces/medals!!! 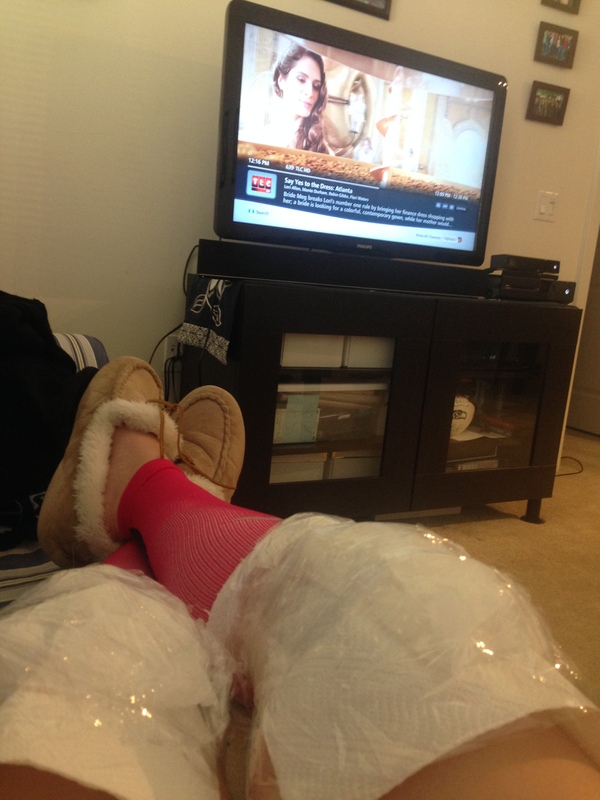 I’m feeling great so far, had a delicious steak dinner courtesy of the hubby, and have ice cream waiting! Ahh the joys of eating whatever you want because you just burned 2,000+ calories! Have a wonderful night everyone! Keep finding your strong! Sounds like one heck of a great race. Congrats on the pr! Thank you! It was an amazing race! Wow, great PR for an unplanned race! You’re going to do great! !